This 30-second TV ad is the opening attack in what Lansing political expert Bill Ballenger considers “one of the oddest” congressional primaries in the country, in the 11th District northwest of Detroit. The race pits colorful one-term GOP incumbent, reindeer rancher and former Santa Kerry Bentivolio of Milford against Birmingham lawyer and foreclosure mogul David Trott. Bentivolio was the unlikely winner of the seat in 2012 when GOP incumbent Thaddeus McCotter abruptly quit the primary in June after conceding that signatures that put him on the August ballot were invalid. That left Bentivolio, who had run a token campaign until then, as the only Republican on the ballot. He survived a write-in challenge backed by the Republican establishment and won in the general election. Trott is chairman and CEO of Trott & Trott, “recognized as one of the nation's largest law firms handling residential default procedures” according to a posting by the Michigan Department of Treasury about Trott's position as trustee on the State Building Authority. It employs more than 400 people, including more than 90 lawyers. 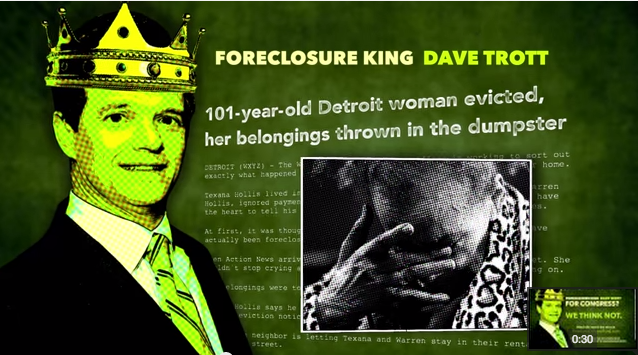 The ad attacking Trott as a foreclosure king is by Freedom's Defense Fund, a conservative, Virginia-based political action committee noted for its 2008 TV ad linking Barack Obama with embattled Detroit Mayor Kwame Kilpatrick. In a saga that drew national attention, 101-year-old Texana Hollis was evicted from her Detroit home in September 2011 after her son failed to pay property taxes and payments on a reverse mortgage on the house she lived in for 58 years. Accounts from news reports and neighbors said her possessions were put in dumpsters outside the home. Hours later, she was taken to Henry Ford Hospital after crying through the eviction, when others realized her heart and diabetes medication had been lost in the eviction. Her son, Warren Hollis, who lived with her, said he had her sign a $32,000 reverse mortgage on the property in 2002. He said he used part of the money to fix a leaky roof but also said he bought a car with some of the money. Records at the time showed the home had an assessed value of $5,215 and that the summer tax bill of $778.44 was unpaid. The U.S. Department of Housing and Urban Development foreclosed on the home after sending multiple notices. Trott & Trott, which represents banks and other lenders in foreclosure and eviction proceedings, handled related legal paperwork. HUD later agreed to sell the distressed property to Detroit Free Press columnist Mitch Albom for $100, with an agreement that Albom’s charity would renovate the home on Hollis’ behalf. Hollis returned to her home in April 2012; she died New Year's Eve in 2013 at age 103. A bailiff carried out the eviction. While Trott & Trott does not personally evict homeowners, Sandler does not dispute that the firm does execute legal foreclosure proceedings on lenders’ behalf. No one would deem what happened to Texana Hollis just or fair. Likewise, lawyers who make their fortune helping lenders evict desperate people from their homes aren’t likely to garner public sympathy. But assigning blame for Hollis’s heartbreaking eviction is another matter. As much as anything, she seems the victim of a son who did not pay bills and did not have the heart to tell his mother what was coming. And officials with HUD and the court arguably could have done more to protect a 101-year-old woman in a wheelchair from harm. To be sure, Trott & Trott’s business includes helping lenders carry out foreclosures and evictions, and the firm has profited from an economic climate that saw 100,000 foreclosures in Michigan in 2011. But the fact remains that Trott did not, as the ad says, “evict” Texana Hollis. That decision was made by HUD. His firm was one link in an unfortunate chain of events. On its face, there is no evidence this eviction was carried out specifically “to line the greedy pockets” of Trott, though the firm obviously gets paid for its work. That's a really thin line being walked in talking about who is to blame for evicting the elderly lady from her home. As stated in the story, it was a bailiff who was on site to perform the eviction, and not HUD or the lawyer who were there to evict her. But when all is said and done, Trott was part of the team that was responsible for the eviction. If evictions were all that Trott handled, shows you what kind of person he is. Sort of like a bottom feeding "ambulance" chaser. Rich, that's like saying Charles Manson's defense lawyer killed 9 people because the court appointed him to the defense. You are way off base. Lots of fault to go around...some more egregious that others. Mr. Trott, in your heart of hearts, can you think of anything you could have done or not done to modify what happened? Really, be honest. The greatest foul is that we write about blame rather than examine how the collective consciousness could allow such a horrid thing to happen to another living being. PM, you must have heard the story on the news. Why didn't you go pay the tax bill for her? All of us are to blame?? How do you get a $32,000.00 Mortgage on a home that has an assessed value of $5,215.00? And how many Credit Default Swaps did that Reverse Mortgage generate. Just another story of greed and deception that eventually brought the real-estate market crashing and the great recession. I am sorry, I would have to agree with Rich in the first response comment to this article. Anyone who makes his living doing foreclosure litigation has to shoulder a part of the responsibility for the eviction of Ms. Hollis. And, to some degree, shame on Bridge for splitting hairs on this issue in the defense of Dave Trott. Trott is not to blame for the eviction. Yes, he makes a profit out of the legal proceedings but he is only following the law, and he works for the firm that hires his company. If HUD did not hire Trott, HUD would have hired a different firm, and the same result would have happened. It is the son of the elderly woman who is to blame, and the bank that allowed the reverse mortgage of a home that was not worth the $32,000. "I just processed the paperwork" is very close to "I was just following orders" when it comes to invalid excuses for unethical behavior. The specifics of the Texana Hollis fiasco aren't as important as the bigger picture -- that David Trott, by his own admission, made all of his fortune on executing foreclosures. He is a proud member of the 1% based on doing the dirty work for banks, predatory mortgage lenders, and sometimes county with property tax liens. Trott & Trott lawyers represent the lenders in court and in legal arbitration with homeowners in trouble. David Trott's people file the legal notices, process the foreclosure sales and property auctions, send the letters demanding immediate payment, post the eviction notices on the door, and in the end it is Trott & Trott who transmit the lender's eviction order, deploying the bailiffs or Sheriff's deputies to perform the evictions. And on the public policy side, it was David Trott who led the effort to convince the state Legislature in 2011-2012 to reduce the "redemption period" between the foreclosure sale and final eviction from six months to two, and to allow the lender to order an immediate eviction at any time, even during the redemption period. Why would HUD privatize legal and procedural matters is beyond me. It is akin to privatizing prison services. I don't have an issue with any person or lawyer making money, but having public funds (and lots of them, it sounds like) go to a private attorney to do the paperwork for an eviction so that a publicly funded bailiff can evict someone seems like a waste of public resources.... particularly when said private attorney is now running on a platform that includes cutting taxes and government spending. Maybe we can start by not using public dollars to pay private attorneys to hand cases involving public entities. I don't understand how she was liable for mortgage payments. I believe that reverse mortgages do not have payments due until the house is sold or mortgagee dies. There is a discrepancy between what Bridge quoted Warren Hollis as saying and what Yahoo attributes to AP. Yahoo says, "Wayne County Chief Deputy Treasurer David Szymanski told The Associated Press on Tuesday that the Hollises took out an adjustable-rate mortgage in 2002. A default and foreclosure notice was filed in November." Bridge says, "Her son, Warren Hollis, who lived with her, said he had her sign a $32,000 reverse mortgage on the property in 2002." That answers Sheldon's question as to why mortgage payments were owed. Of course, that's irrelevant to the real issue, which is the unfairness of the ad. The ad is absolutely ludicrous, but what is really troubling is the fact that Freedom's Defense Fund's assessment of the voters was accurate. Too many people, judging from the posted comments, are not sufficiently sophisticated, do not have the good judgment, to evaluate the ad. Elvis5674 apparently would not object to the eviction if was done by a lawyer on the public payroll. Mr. Hetzer seems to object to the very idea of a lender foreclosing on someone who fails to make the payments they agreed to. And if Rich's comment is representative of the typical voter, then God help us. But Bridge is absolutely right to call a flagrant foul on this ad. I hope that Mr. Bentivolio has the integrity to repudiate it. What you say may well be true. But since Mr. Trott's law firm had something to do with my eviction and personal bankruptcy about six years ago he gets not one atom of sympathy from me. Like I've heard said---at it's core all politics is personal. And evicting people surely doesn't make you very compassionate. Sounds to me like an "I was just doing my job" defense. Wouldn't be so bad if he didn't make so much money doing it---profiting immensely from other people's misery. Just goes to show you the kind of candidates Republicans come up with---a whacko maverick and someone who makes his living evicting people. That right there would be more than enough for me to vote against him and vote Democratic. Enough said. Could anybody that lives in the 11th district file a complaint with the Federal Trade Commission? "When the FTC finds a case of fraud perpetrated on consumers, the agency files actions in federal district court for immediate and permanent orders to stop scams; prevent fraudsters from perpetrating scams in the future; freeze their assets; and get compensation for victims" ~ Federal Trade Commission web site After all, these folks are attempting to to get my VOTE which has immeasurable value! Did Mr Trott evict the lady, or did he just handle the paperwork? It looks like a classic example of a distinction without a difference. I will always vigorously oppose Trott. I remember going to the Trott & Trott office yrs ago. Next to the American flag was a Trott & Trott flag outside. Dealing with that law firm was surreal. Glad I had a lawyer with me. He now has the audacity to run for public office and even utter Obamacare opposition. This guy has no compassion at all, strictly trying to sell bill of goods to get elected. People wake up! Vote against Trott!